As I mentioned when I posted the black and white version of this princess paper doll last week, rarely can I look back and share several stages of paper doll creation. From the sketchbook stage to the coloring stage. There’s a sort of allusion that I think is common in blogging. It’s always presented as current, as immediate. Sort of the “I just threw together this perfect brunch for my family on Tuesday and I wanted to share it with you all” idea. The truth is that while sometimes I work against the wire- barely have the paper doll done before I post it- I think most people understand that generally there’s a long wait between idea, rough sketches, final sketches and posted paper doll. So, as you all probably know, I love drawing princess paper dolls. It’s an excuse to let out my girly side and create fluffy over the top dresses around whatever themes strike my fancy. For this princess set, I wanted to use some of the motifs and styles of African wax print fabrics. Originally, I have conceived of a pink, green and purple color scheme, but it really didn’t work in practice. So, back on Pinterest, I selected this wax print fabric to be my basis for my colors. The orange, red, blues and yellow color scheme seemed like a lovely change of pace from the pinks and purples that are generally associated with princess paper dolls. Plus the white really lightened up the outfit. I’ve decided her white shoes are a sign of wealth, because can you imagine trying to keep white shoes white? I mean, I don’t own any for that exact reason. Now, if you’re thinking, but she needs more clothes… Than I recommend considering borrowing gowns from the Yellow Princess, Rose Ballgowns or Garden Ballgowns. 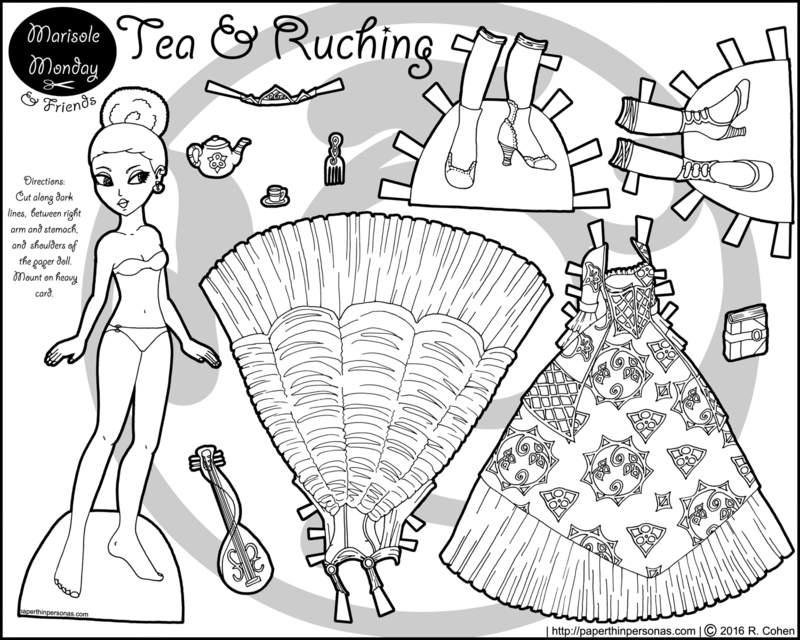 All those sets share the big-skirted look of today’s princess paper doll. Thoughts on today’s princess paper doll? Feel free to leave a comment. Also, on Friday, there will be Elves! 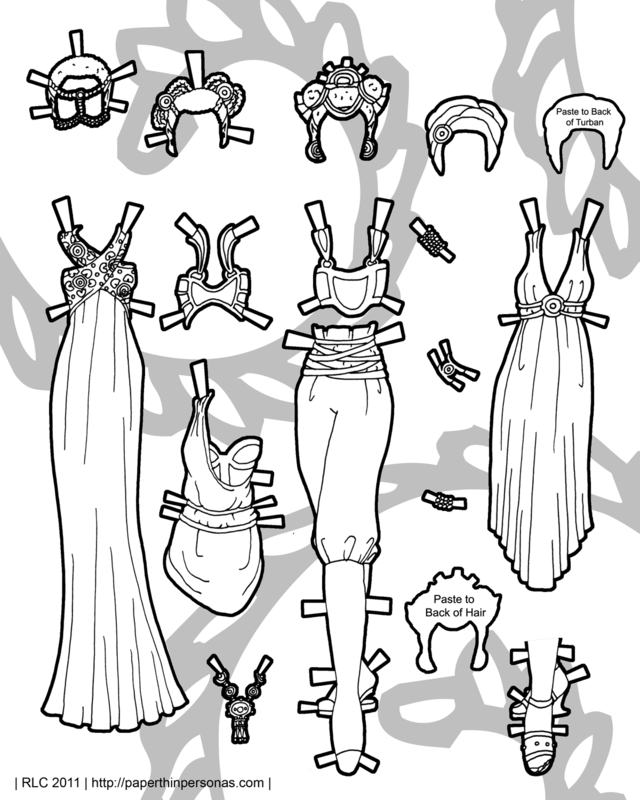 Today’s princess paper doll has been a long time coming. Back in September, I posted the penciled and inked versions of today’s paper doll set and then I posted a screen capture of the colored version in December and now, in January, you get the final black and white with the final color version going up next week. Generally, I finish the colored version and the black and white version about the same time, but I space the posts out by a week for my own sanity. Plus the colored version of this particular paper doll set gave me fits. I won’t even get into how many variations I made in color choices, but it was brutal. I’ll save that rant for next week’s post. Okay, so my initial inspiration was African wax print fabrics which I have always had a deep fondness for. If you look closely at her patterned dress, you’ll find a motif inspired from this design and more on my Pintrest board of African Prints & Fashion. Primarly coming out of West Africa, these prints have a complex history which I confess I am not an expert on. Slate is a nice article on African Wax Prints highlighting some of those complexities. Beyond my fascination with African wax print cloth, I wanted to do a rather traditional princess. To me, that means big skirts (blame it on growing up in the late 80s) and things that are a big over the top. Of course, big hoop skirts always remind me of the 19th century, so her stockings and shoes owe something to that era. I’ve been taking a Creativebug class where you draw something every day for the whole month of January. The January 2nd assignment was tea cups and you can see my version over on my Instagram account. (Yeah, I just joined Instagram. We’ll see if I like it long term.) Her teacup was drawn weeks ago, but I don’t think I’m great a teacups, so practice is important. My hope is to get into the habit of drawing a little everyday in a way that is NOT directly paper doll related. We’ll see if I succeed, but I think it would really help my art. So, this is a pretty darn old paper doll. Originally inspired when I did my Marisole Inspired by Africa paper doll, I just recently got around to finishing up cleaning her up and getting her posted. 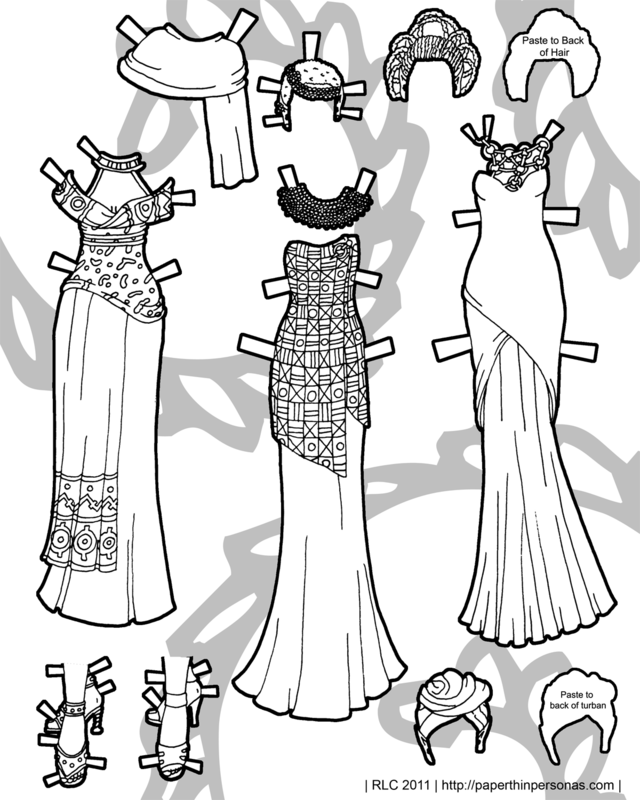 I’ve been having some requests for more black and white paper dolls lately. 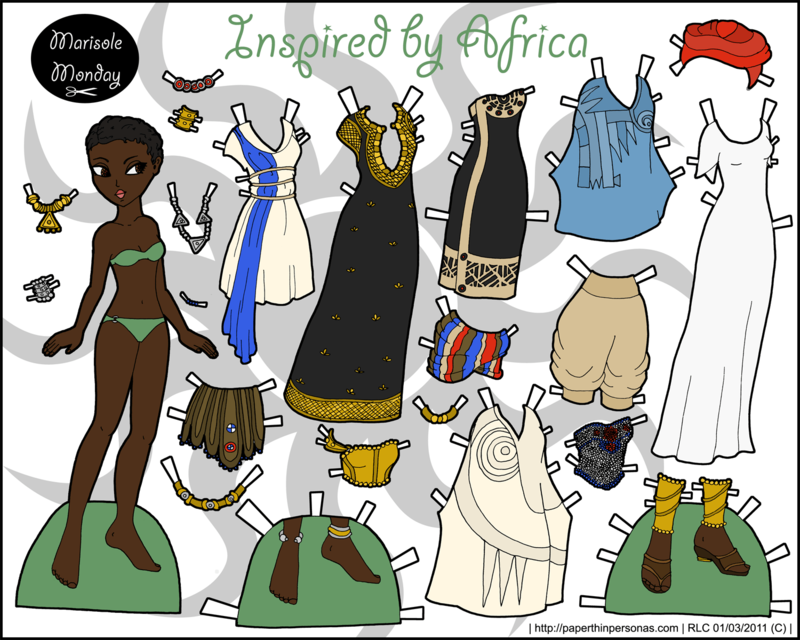 This paper doll was inspired by African Fashion Week along with the idea of doing a set of elves based on something other than the traditional Western Europe approach. Of course, I never got around to drawing any of the other ones, so we’ve got one elf here. She might be a trifle lonely, but if you print out several of her and color each of them a little different she can have friends… or clones. Clones are like friends. One of my goals in posting this paper was to respond to those people who’ve requested more black and white paper dolls to color. So here is one- print her, color her and have fun. 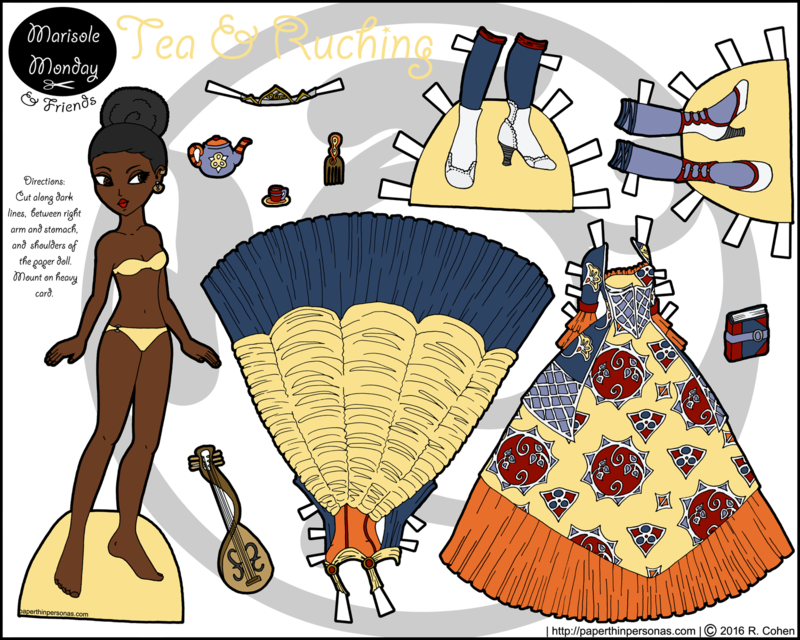 Way back in June, I did a paper doll set roughly based on some Asian costumes and mostly based on what I draw when I’m bored in class. Lindsey asked if I would consider doing an African inspired set in the same style. Now, I wasn’t against the idea, but I didn’t know anything about African dress. After several months of looking at pictures, many books borrowed from the library and a fair bit of internet searching, I can now say I know a little bit about African dress. To give credit where it is due, the dress with the blue sash on the cream is based on a dress in the South African Fashion Week show of Amanda Laird Cherry. You can see a picture of the original garment here. The trousers are based on this design by the African designer Janice Morrison. I used a considerably more subdued color pallet for my paper doll based on the colors of mud cloth and traditional bead work. Edit: It has come to my attention that some sites are linking this post as actual African traditional dress. It is NOT. Please don’t pro-port that it is.